Our kennel is heated with radiant floor heating on both the inside and outside of the dog runs and we have an air exchanger installed. During the summer months we have air conditioning to keep your pets cool and comfortable. 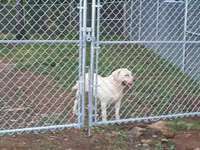 The kennel has a monitored security system with a smoke detector in each room to keep your pets safe and secure. 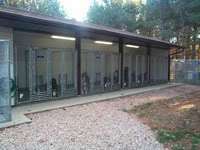 The building is surrounded by a six foot high fence on three sides giving a large exercise area where your pets can feel free to run and play. We can feed Eukanuba brand pet food for an additional charge during your animals stay. Pets with special needs are also accepted such as foods for special diets or medicine. We sell Eukanuba and Iams pet food products. Please contact us for more information on the products we currently have available. You and your pets are welcome to come for a tour, just contact us before you arrive!